Now we know what my friends think of me! In other news, my baby graduated from pre-school and will start kindergarten in the fall. Here's the class waiting to get their "diplomas." Sob. 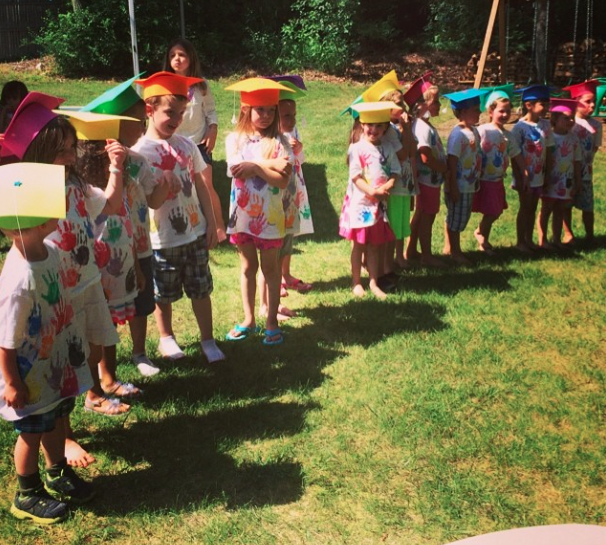 I would just like to point out that that preschool graduating class is adorable. That is all. Diversified gut flora, magnesium, ketamine, BDNF, GABA, and slow-wave sleep are all downstream products of a diet filled with butyrogenic prebiotics, ie. inulin, resistant starch, larch AG, XOS. These 4 items are underrepresented in SAD and nearly extinct in low carb/paleo diets. Great post and great blog. Please keep writing on this subject - it's really interesting and important. Whenever I tell people the gut influences the brain, they look at me like I'm nuts. But I'm certain it is true, even if I (and no one else) can yet explain the mechanisms with precision. First, Jad, thanks for that link, fascinating and was a thought in the back of my head for a while. I have an undermethylation issue, could be from MTHFR mutation (I am awaiting my test results. But I know for certain that SIBO, mostly likely from Candida is a huge problem and reduces methylation by its waste product acetaldehyde. Plus candia loves a folate rich environment. B12 and 5-MTHF supplements erase my anxiety and depression. And that means a lot coming from me since I was in the psychiatric hospital twice. But I found controling my SIBO meant controlling my mind. I'd like to hear more about what you have to say. From psych wards to mind control over SIBO? I'm determined to get a better grip on my own depression and anxiety (diagnosed bipolar but don't buy it). Keep in mind Biofilms as well. Bartonella as a cause of neurological illnesses, psychiatric illnesses have received virtually no attention. This is amazing, because many of my Bartonella patients have some character, mood or cognitive alterations. I am a clinical researcher affiliated with NIH in MD and also a chronic somatizer and am currently reading yours and Dr Barsky's book.